Many hone their street skills and are very good riders but could learn/benefit from off-road riding. Riding motorcycles on-road or off is all about traction and feel. Under most street circumstances there’s a considerable amount of traction. Modern tire technology provides traction capabilities equaling or exceeding racing tires of just a decade ago. Few riders ride hard enough to exceed the limits of traction on the street but what about unexpected situations like rain, gravel or sand? These variables can lead to a lack of traction for an instant or longer. Most riders have experienced the “pucker” of unexpected traction loss and survived. Others have had the unpleasant experience of a get-off due to traction loss and inexperience in handling the situation. Most experienced riders have heard or read about the traction equation. This has been presented in many articles and training curriculum. The traction equation is a nice theory about how to manage your traction “points” to avoid loss of traction. It explains how to manage traction based on how many points are consumed by lean angle, braking and acceleration (but in the end it all comes down to feel). Learning how a motorcycle reacts at, near, or beyond traction limits is very difficult to understand and even harder to learn under high traction street riding. This is where off-road riding comes in as a great learning tool. World-Class riders like those mentioned above recognize the value of dirt riding to hone their traction management skills. When riding on pavement, traction is abundant and pretty consistent. This isn’t the case when riding in the dirt. Riding off-road, you’ll encounter gravel, rocks, sand, mud, uphills, downhills and off camber sections. The traction coefficient is wildly different for each of these conditions and in general is much lower than typical pavement. 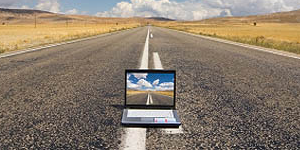 Reading, feeling and managing traction are mandatory for a successful ride. Additionally, in many off-road situations, it’s beneficial (or even required) to intentionally break traction to stop or turn. 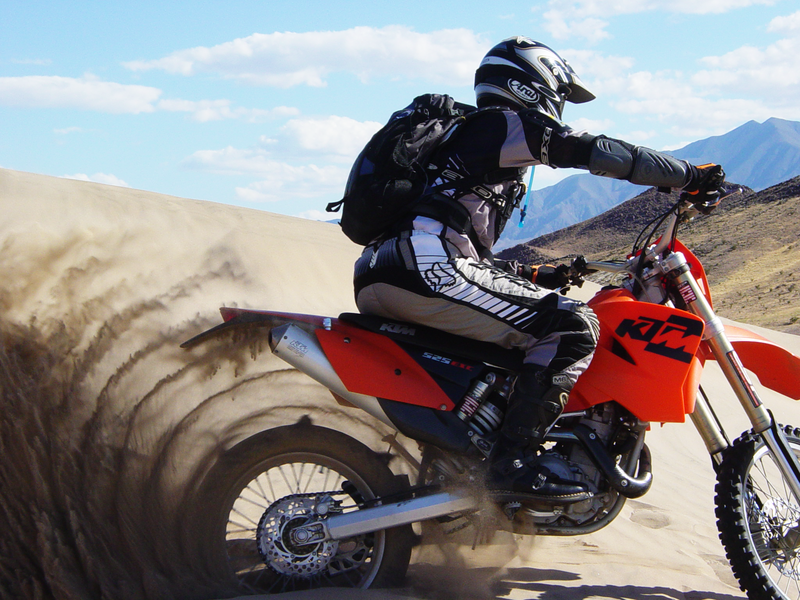 In deep sand, it’s often helpful to tuck the front tire to initiate a turn. This technique helps the tire “bite” into the sand. Limited traction availability necessitates limiting the weight on the front tire, so it’s common off-road practice to momentarily lock up the rear wheel upon corner entry to “back it in” and initiate the turn. It’s also helpful to get on the gas and break the rear tire loose or “steer with the rear” to keep extra weight from the front tire and help the bike turn. These techniques will make you comfortable with loss of traction. They’ll also help develop the required feel for traction. You’ll learn and understand how a motorcycle feels when traction is about to be lost. By experiencing this feeling and learning to react quickly (but smoothly) to remain upright, you’ll learn valuable lessons that transfer directly to your street riding. As your off-road skills and confidence improve, you’ll take on greater challenges. You’ll also likely crash. Actually, crashing is inevitable but in most off-road situations your speed will be lower and the landing surface will likely be more forgiving than pavement. As bad as crashing sounds, it can also be a valuable learning tool. Learning how to “stay with it” until the inevitable end and even learning how to fall can literally be a life saving (although sometimes painful) experience. Off-road riding has a lot of other nice and fun benefits. You’ll be out in nature and get to see sights that less adventurous types never get to experience. We have been doing dual sport trips to the Tennessee and North Carolina Smoky Mountains for a decade or so. These trips are some of my favorites largely due to the awesome scenery we encounter. We’re usually the only people around and find many beautiful and peaceful places. To become a better street rider, consider getting off of the pavement and into the dirt. If you need convincing, consider this question. You’ll also get quite a workout compared to street riding. Standing on the pegs is one of the best techniques for controlling a motorcycle in bumpy conditions. It’s also a killer leg workout. Body position is very important in off-road riding for traction, control and comfort. you’ll constantly be moving around on the bike; sitting, standing, sliding around on the seat, loading footpegs, etc. Chances are you’ll get into situations where you must drag, push, or even lift bikes to get around obstacles or after a fall. One of the biggest and most fun aspects of off-road riding is that you can be a complete hooligan. You’re not on public roads and can do just about anything you like. Wheelies, big slides and roosting your buddies are all great fun. Of course, respect for neighborhoods and nature is wise but otherwise let loose and have a blast! Getting into off-road riding is reasonably inexpensive. For first-timers there are plenty of places to rent dual sport bikes for a day or two to get your feet wet, so to speak. Dual sport bikes are a great way to get into the sport. Used bikes such as the Kawasaki KLR650 are abundant and cheap. Dual sport bikes also allow riding legally on public roads, reducing or eliminating the need for tow vehicles to enjoy the sport. Dual sport bikes also make great street bikes. They’re light and manageable compared to street bikes and their suspension absorbs bad pavement easily. For beginners, street gear will do the job but you’ll probably want to purchase some off-road specific gear as you get further into the sport. My first recommendation would be a set of motocross boots. Motocross boots have thick soles and are very tall and stiff. They offer much more protection than street or ADV boots. These features come in handy in off-road riding where you’re likely to have your foot down in a corner, slip off the pegs or fall off. You’ll bang your feet on rocks, tree roots, etc … believe me. Depending on where you ride, the next piece of gear to consider might be a dirt helmet which will accommodate goggles. In dry and dusty conditions, street helmets don’t block the dust and your eyes will become dry and scratchy. Goggles are much better at thwarting dust. Dirt helmets also tend to have much better ventilation which comes in handy when you’re getting a good workout. Speaking of a good workout, a hydration pack is highly recommended. You may not be within a source of water for long periods of time and keeping hydrated is very important. While this brief article describes the benefits of adding off-road riding to your bag of tricks, it’s only a beginning. There’s a lot of information available on the web and from other sources. The best resource is a friend who rides off-road and is willing to show you the ropes. Off-road training classes are available in many areas. One of my good friends tried off-road riding with our group a couple of times and didn’t have good experiences. Last year he attended an MSF dirt riding course prior to our spring Smokies trip and was a completely different rider. He had a great time and has since bought a dual sport bike. He’s looking forward to our next trip. Best of all, your street skills and confidence will increase dramatically! Do You Enjoy Dirt Riding? What amazing places have you seen as a direct result of being a dirt rider? How has dirt riding effected your street skills? Your input is invited. Post an article! Great article, Joe! My wife recently signed up for a class that advertises itself as “dirt training for street riders”. The class focus is around your premise that dirt riding experience can make you a better street rider. That is great. It’s nice to have your wife participate in the sport and also recognize the value of training. That’s a great plan. You will learn a lot in the MSF class. Backing it up with an awesome Smoky Mountain dual sport weekend will enforce the skills learned in the class. I completely agree and plan to take the MSF course before my (already booked) first enduro rally.